Flora Belle Crooks, age 89, of Paducah passed away at 12:30 p.m. Monday, December 3, 2018 at the Ray & Kay Eckstein Hospice Care Center. 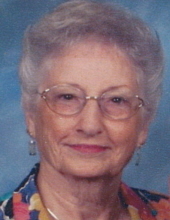 Flora Belle was a member of the Reidland United Methodist Church and a homemaker. Survivors include one daughter, Reva (Phil) Kirkham, Paducah, KY; two sons, Bobby (Linda) Crooks, Bowling Green, KY and Keith (Karen) Crooks, Jonesboro, AK; one sister, Mae Warren, Paducah, and one brother, Omar Guess, IN; five grandchildren; four step-grandchildren; twelve great-grandchildren; one great-great grandchild; several nieces and nephews. Preceding in death was her husband Elbert Crooks, parents, Edwin H. & Tennie House Guess; one granddaughter, Jessie Twilight; two sisters, Viola O’Brien and Mary Ellen Green; two brothers, Joel Guess and Buddy Guess. Services will be held at 11:00 a.m. Friday, December 7, 2018 at Milner & Orr Funeral Home of Paducah with Rev. Brent Porterfiled officiating. Entombment will follow at Woodlawn Memorial Gardens. Visitation will be held Thursday, December 6, 2018 from 5:00-8:00 p.m. at the funeral home. Expression of sympathy may be made to Reidland United Methodist Church, 5515 Reidland Road, Paducah, KY 42003 or to Lourdes Hospice, P.O. Box 7100, Paducah, KY 42002.